Thank you for visiting us on our website and we would be very pleased if you would come and visit us in person. We are an independent Church in a modern building and with a contemporary approach to reaching out to our community with a Family Service, Parents & Toddlers Group, Creche Facilities and Junior Church. We also have get togethers for older ones as well as our regular services. As the Church benefits from a modern and adaptable building it is used by the local Community for such events as exhibitions, elections, Police and Councillor's Surgeries. We hope this Site is helpful and we will see you soon. If you are a visitor to the area over the Easter period, we would welcome you to come and join with us at 11:00am for our Easter celebration service, when we rejoice in the resurection of our Saviour and Redeemer, Jesus, and the hope that this gives us for the future. Coffee and Craft - April - 1st, 15th and 29th. All are welcome to attend, even if you only want to come for a drink and a chat. We want to advise all our readers that there will be no more registrations for attendance at the Mother and Toddler Group until the new school year in September due to the numbers currently registered. Obviously there will be a number of children that will be leaving us as they will be going to school in September. So should you would wish to join the Mother and Toddler Group for the new school year we will have to operate on a "First come basis". 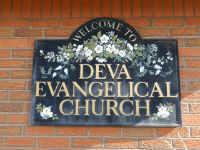 Deva Church is a Registered Charity with reference 1152350.